Welcome to the history blog for the Town of Pine Knoll Shores, NC. Browse our site and discover the people, places and events that create the rich heritage of this unique coastal community. Come back often. New posts are added monthly. 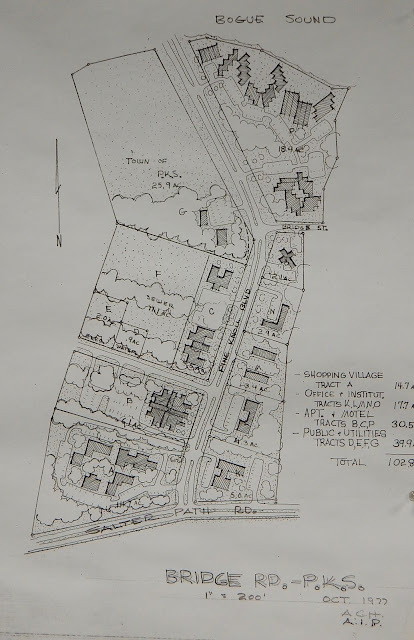 A.C. Hall design drawing of proposed town village from PKS archives. Putting development trends in perspective, 1981 Commissioner of Planning Larry Jerome counts 1,103 single-family lots in town and states, “…with respect to condominiums, present zoning allows a maximum of 1,700 units.” He indicates the peak population in 1980 is approximately 3,400 with only 775 of these being full-time residents. He overestimates by almost 50% when predicting the full-time population could rise to 3,000 in 1990. Despite all the talk of growth, Pine Knoll Shores remains a small town. Most of the space in monthly 1980-82 issues of The Shore Line highlights that fact. Editors George Eastland and Lenora Roberson feature news about the Garden Club, Ancient Mariners’ Bowling League, fire department volunteers, rescue volunteers, hospital volunteers, new neighbors and neighbors helping neighbors. They had been visiting Al and Midge Wolfe Sunday evening and on the way home their car slid off Hawthorne Road. They started walking but found the going so rough they stopped in at the E. R. Smiths at Hawthorne and Sycamore to warm up. Starting out again they found they were losing ground to the storm and returned to the Smiths to accept their invitation to spend the night. The following day they made it home. The following month, The Shore Line marks the passing of Pine Knoll Shores famous alligator, locally known as Charlie. His body is found floating in the canal off Oakleaf Drive on April 13, 1980. 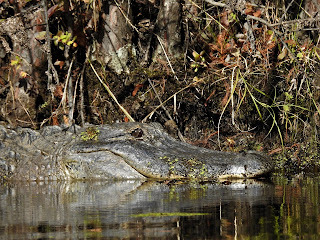 A victim, perhaps, of March’s extreme winter weather, the loss of natural habitat or maybe just old age, Charlie was over eight and half feet and weighed about 250 pounds. It was not uncommon to see him sunning on golf course greens. 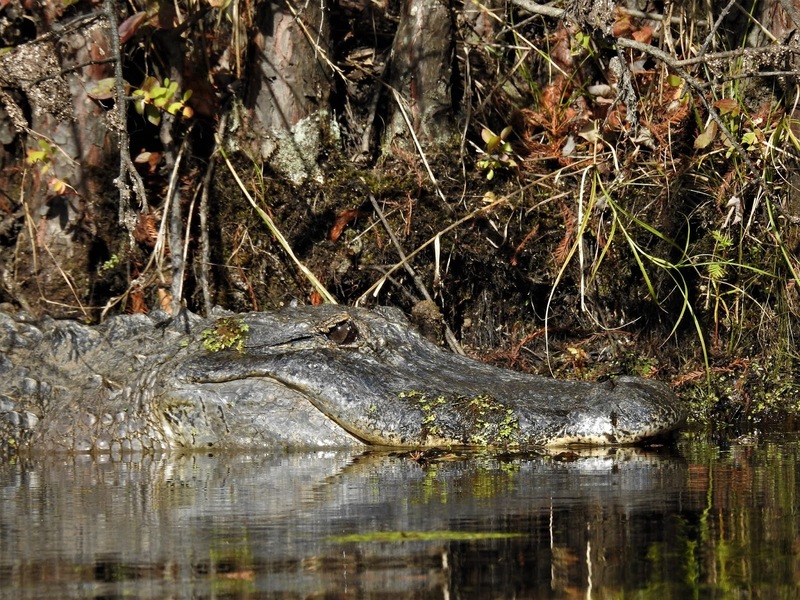 We do not have a picture of Charlie, but this NC alligator by Debbie Morris gives us some sense of how large he may have been. 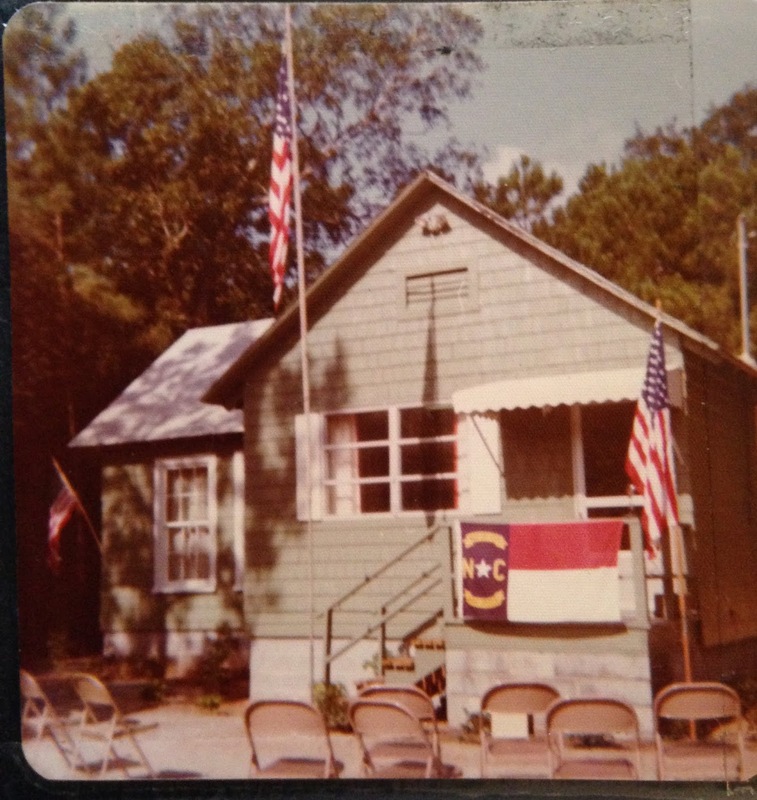 Happily, in 1981, Carteret County Library opens a branch in Pine Knoll Shores at the Marine Resource Center. A weekly food Co-op becomes active in town, and Vision Cable brings cable television to town residents. Unfortunately, conflict also weighs heavily over the 1980-82 timeframe and is reflected in The Shore Line. Disagreements over a central sewer system, over liquor-by-the drink, over a village shopping center, over who is responsible for dredging the canals, over oceanfront setbacks, over flooding in the eastern section of town are among the issues dividing residents. The bitterest fight is over the shopping center. This 1977 sketch by A.C. Hall shows where the shopping village and the bridge might have been. Photo by Susan Phillips from PKS archives. In April 1980, Mayor Ken Haller resigns under pressures of the job, and Wayne Cleveland becomes mayor. At the end of 1981, Lenora Robinson resigns as associate editor of the paper. At the end of 1982, Shore Line's George Eastland resigns, and former Mayor Ken Haller assumes the role of editor with Noel Yancey. I like to think this editorial changeover may be emblematic of the importance of a community newspaper in a small town. Architectural Drawing photographed by Susan Phillips from PKS town archives. The Shore Line was not being published when the dedication took place. “After a hiatus of more than a year the Shore Line is back in business with a new format, a new editor and a new sponsor.” With these words, 14 months after founding editors Betty Hammon and Mary Doll said their goodbyes, the paper begins anew in September 1979. The new format is 8”x11” double-sided mimeographed sheets with underlined headers for stories. The new editor is George Eastland, working with Associate Editor Lenora Roberson. The new sponsor is the Town of Pine Knoll Shores. Although the Town will assume the printing and delivery costs in order that the paper may be received by all of our citizens without charge, it will exercise no control whatsoever over the content of the paper or over its editorial policy. In each issue, however, sufficient space for the Town to advise our people of actions taken or to be taken will be made available…. The volunteer rescue squad with 12 EMTs and nine drivers reminds readers of the need to be prepared for day-to-day emergencies. It makes a plea for more volunteers. November elections in 1979 return all incumbents to the Board of Commissioners. They in turn, reappoint Ken Haller, who has served as mayor since 1975. Among municipal concerns that make the paper in 1979 are parking on Dogwood Circle and Mimosa Boulevard, stray animal problems and the enforcement of leash laws, lighting at intersections on Salter Path Road, attempts to increase density restrictions in zoning ordinances, the need for residents to install visible house numbers and requests for “Children at Play” signs in growing neighborhoods. Although 1979 issues are short, no more than four pages, they still help build a sense of community. Before the municipal election, Shore Line provides short biographies of candidates. And, in each issue, we meet new neighbors and hear from local clubs, such as the Ancient Mariners and the Garden Club. Photos by Susan Phillips from Garden Club Albums. The year ends with thousands of luminaria along driveways, sidewalks and bulkheads to celebrate Christmas, a tradition started by the Garden Club several years earlier. The year also ends with the promise of continued monthly Shore Lines. “So this is the final issue,” announces Mayor Ken Haller in the June 1978 edition of what has become the Pine Knoll Shoreline. Throughout 1977, founding editors Mary Doll and Betty Hammon expressed their lack of time and energy for keeping the paper going. However, by adding George and Moni Eastland to the staff and having the paper appear quarterly rather than monthly, they hoped to continue. The March 1978 issue appears on schedule, but by June, the plan has fallen apart. …we’re in this crazy planet full of crazy people, somersaulting around in the sky, and every time we turn another somersault, another day goes by and “There’s No Way to Stop It.” But in this case, the last somersault has been turned and we would like to quit while we are ahead, as the expression has it…. The town is firmly established. It will continue to grow, and infrastructure development to support that growth is underway. George Eastland writes in March 1978, “Plans for the new town hall-fire-and-rescue complex are continuing apace, with construction expected to begin within the next 90 days and completion later this year.” The construction timetable may be overly ambitious, but plans for acquiring fire and rescue equipment and for having trained volunteers to use the equipment are in progress. 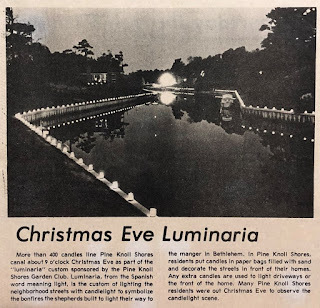 This 1977 newspaper clipping photo was taken by Susan Phillips from a town scrapbook. Also supporting a sense of community are ongoing volunteer efforts and organizations such as the Garden Club, Ancient Mariners and Country Club. All are well established and have activities that will continue to bring members of the community together whether or not events are reported. The Shore Line changes as 1977 progresses. It adds writers, moves from black mimeograph print to blue stencil, reduces frequency of issues, grows from four to six pages, introduces yellow paper and begins to use double-sided sheets. There is no shortage of news and interesting stories, but first a look at what is happening with the paper. THE SHORELINE DEADLINE HANGS over our heads like an ominous rain cloud each month (a month goes by at about the speed a week did in one’s youth) and we find that lately, as wives of traveling, working husbands, we are traveling too (not working too, but traveling too). And so, one morning recently, we had a summit meeting over coffee and buttermilk biscuits, and we made a staggering decision: FROM SEPTEMBER ON, WE WILL PUBLISH THE SHORE LINE FOUR TIMES A YEAR. So, they produce no paper in October and November of 1977, and the first issue in 1978 appears in March. …the George Eastlands are joining our, for want of a better word, ‘staff,’ and we are enormously pleased, sighing with joy, actually. They’ve done a couple of stories for us this time. You’re going to love the new style and approach to things. They are George and Moni Eastland, who recently moved to Salter Path Road in Pine Knoll Shores. 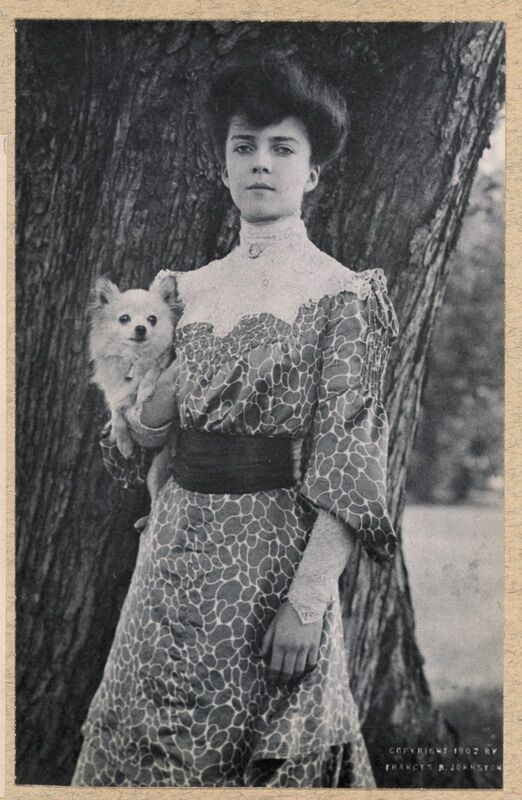 One of the first articles George Eastland writes is “Alice Roosevelt Slept Here.” Unfortunately, from the perspective of recent research, the historical accuracy of his article is questionable. The “Here” he is referring to is the small section of Alice Hoffman’s house serving as the first town hall. He claims Hoffman’s cousin Alice Roosevelt liked to stay there, but all evidence gathered by the town’s History Committee confirms it was Hoffman’s kitchen not a bedroom. And, was “Alice Roosevelt” here? Yes, grandchildren of President Theodore Roosevelt, children of Alice Hoffman’s niece, developed Pine Knoll Shores, and among them was Grace Roosevelt, but no Alice Roosevelt. 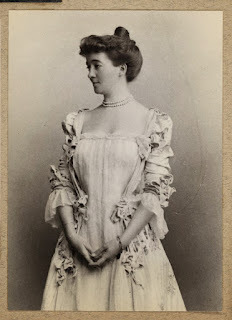 Alice Hoffman was not a blood relative of the Roosevelts, and, though TR’s eldest daughter Alice was Hoffman’s contemporary, no other historical record of her visit seems to exist. A relationship between these two emancipated women would, however, make an interesting story. Eastland correctly concludes, “The house was an intricate part of the fabric of Bogue Banks,” but incorrectly refers to “its razing.” In fact, sections of the house were sold at auction. Alice Hoffman's house before it was removed from its original PKS site. In any case, its dismantling was, as he states, “a loss to the island.” Unfortunately, the one remaining wing serving as town hall in 1977 is also destined for the auction block; a new “municipal building” will replace it. The progress of plans for the new municipal building appears in almost every 1977 issue of the Shore Line. January begins with a thank-you to volunteers for helping clear the site. A February story looks back to 1971, when the Roosevelts “gave the town acreage where the present town hall stands… and where a proposed town hall and firehouse would be located.” In March comes an indication that there will be a referendum on the overall “plan for a municipal complex.” April provides “BIG NEWS: The plans for the proposed building for PKS municipal area are on display….” These “exciting, contemporary style” plans include offices and work areas as well as space for fire and police departments. In July, a public hearing on the new municipal complex is held. In August, there is a referendum. “Yes” votes mean Pine Knoll Shores will have not only a new town hall but also its own fire department. The issues pass easily with 189 voting, fewer than “half the registered voters” and a small fraction of the total population. This 1967 ad shows roughly what constituted PKS in the 1970s. … a channel was dredged on the south shore of the Sound paralleling what is now Oakleaf Drive. 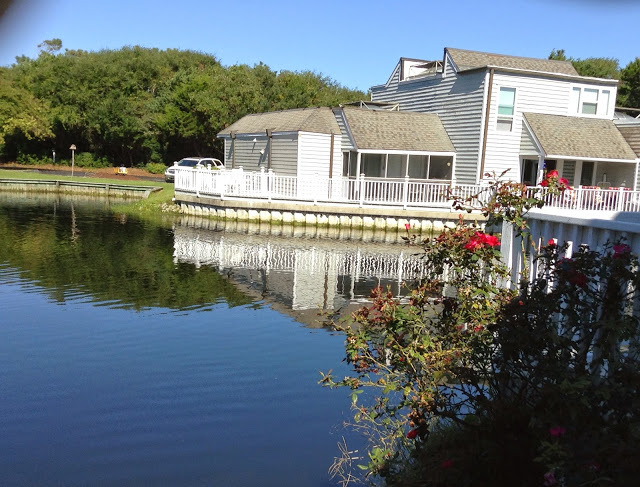 The canal and channel make the greater portion of the second phase of Pine Knoll Shores an island within an island, accessible on Oakleaf at McNeill Inlet bridge and by the Mimosa bridge near the Ocean Park at Salter Path. In addition to the main ‘canal,’ there are branches and basins—Brock Basin, Hall Haven, Davis Landing, Hopper’s Hideaway, Hearth’s Cove, and King’s Corner. The above place names appear without further explanation but provide a good list of key players in the early development of the town. George McNeill, a local attorney, worked for the Roosevelts and drew up many of the original legal documents that determined the character of Pine Knoll Shores. Don Brock did early survey work here as an employee of Henry Von Ossen and Associates, became an employee of the Roosevelts and played a key development role from the 1960s through the 1980s. 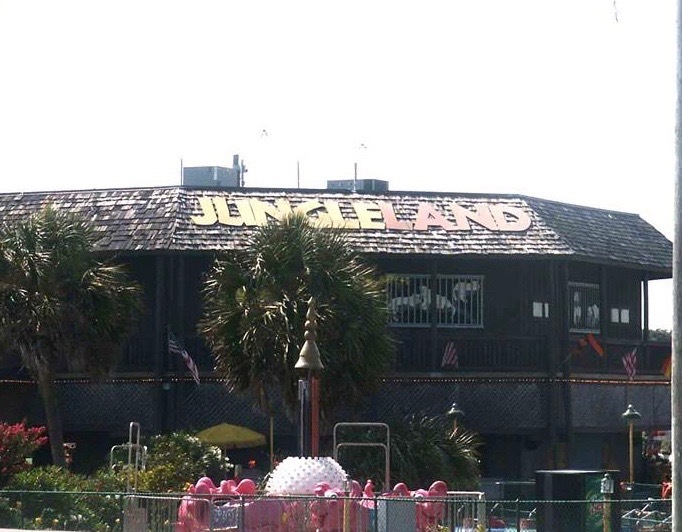 A.C. Hall, Raleigh City Planner and owner of the Atlantis Lodge, drew up plans for “new” Pine Knoll Shores. A.C. Davis, a heavy-equipment contractor, dredged canals and made equipment available to clear other land as the town developed. Harry Hopper, a management consultant, worked for the Roosevelts through Stone and Webster management firm. Ted Hearth, an attorney for the Roosevelts, also worked for Stone and Webster. Charles King was a land planner, who did survey work during the development of the so-called “new” Pine Knoll Shores. But a newer Pine Knoll Shores is yet to come: “And now, plans are being made for another beautifully planned section of the community to be located to the west of the Roosevelt State Park. These plans include a boat basin for the use of its residents.” This plan is, of course, for Beacon’s Reach. Statistics printed in December put the Pine Knoll Shores of 1977 in perspective. It has a population of 770, less than half its current population. Atlantic Beach and Emerald Isle are even smaller with 560 and 260 respectively, according to the North Carolina League of Municipalities. Morehead City’s population is listed at 5,670 and Beaufort’s at 3,800. 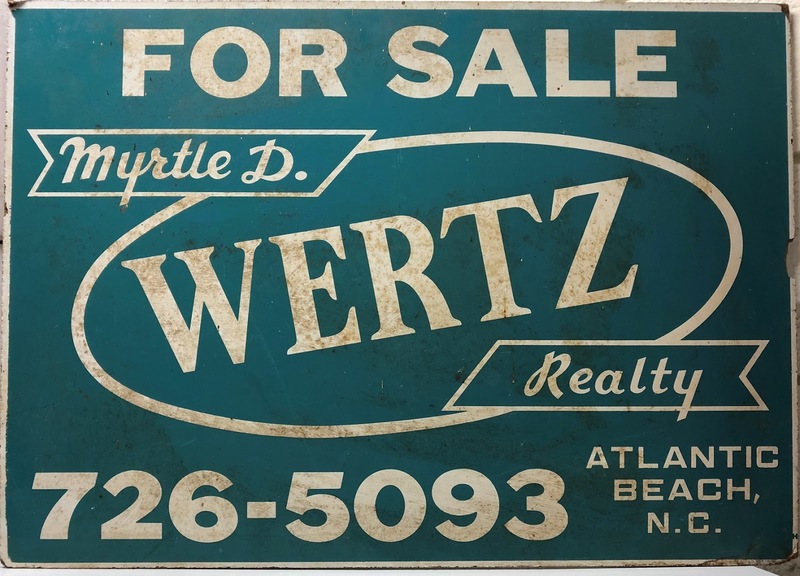 According to the Shore Line, Pine Knoll Shores’ tax rate in 1977 is 20 cents per $100 of assessed property, by far the lowest in the county; however, the value of its real property is the highest in the county— $41,316,000. Emerald Isle, with its long stretch of oceanfront property, is a close second even though its population is the smallest. Interestingly, the listed value of property in Beaufort is only $21,094,680. Later, restoration of historical homes and new development will raise the profile of Beaufort considerably. For the next several years, coastal development will remain in high gear. By looking back and forward, the Shore Linein 1977 prepares readers for a bigger Pine Knoll Shores. In July, they announce: “As the town grows so grows the Shoreline group.” Joining those collating and mailing issues are a typist and four new writers—Verna Armstrong, Audrey Hoffmer, Newell Haller and Louise Baker. All are volunteers, but mailing costs have risen, so 237 residences receiving Pine KnollShore Lineare asked to pay $3.50 for a year’s subscription, up a dollar from 1974. The January issue begins with two announcements: the town has collected $54,683 in property taxes and has just added $1,373,000 worth of new property to its tax records. Following these reports is an amendment to the zoning ordinance preventing construction of a freestanding convention center. All year long, the paper reflects an acceptance of growth and a desire to control it. …which shall attempt to assure “that proposed construction will make effective use of the terrain and environment, …preserve to the extent possible existing trees and vegetation and advise on exterior design and materials that harmonize well with the natural environment….” Town Attorney Taylor points out that such a Commission can advise only. …while maintaining the allowable density of ten living units per acre, [the provision] permits density to be varied on specific lots in a subdivision up to a maximum of 15 living units per acre in order to achieve best use of land and terrain, provided the average density of the entire subdivision does not exceed 10 living units per acre. This revised zoning eases the way for developers who are about to build condominiums, while still controlling the size of those complexes. On October 28 Ray Scoggins issued a building permit to Balwade to build 32 condominiums west of Pine Knoll Townes. …There will be two buildings, one behind the other parallel with the ocean. Much of the natural vegetation on the site will be retained and the rest restored to its natural condition once the construction is completed. Construction is also starting on Coral Bay West, which is west of the John Yancey across from Reefstone. Twenty-four condominiums are in the plans for Coral Bay West. Here’s the thing: …BEAHAVEN, INC… handle[s] the two western-most rows of the condominiums…. Soon they will be turning the development over to its owners’ association…. the other four rows of condominiums, to the east, are separate and function themselves, with their owners’ association in command; there are ninety-two units there. The size of this complex is surprising since only 237 residences were receiving the Shore Line. Also, this was the first acknowledgement in the paper of homeowner associations other than PKA and PIKSCO. Reefstone, of course, must have had its own association, and with the new condos would come new associations. 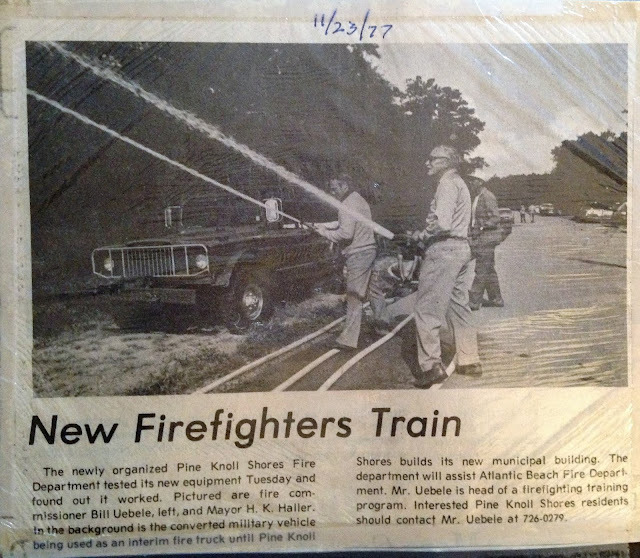 Pine Knoll Shores take over its own fire and rescue work at such time as the town has a municipal center, fire and rescue equipment and a trained volunteer staff… that would include 25 men between 20 and 35 years of age, and more than 80 from the retired group. There is no mention of a concern expressed earlier that Pine Knoll Shores does not have men young enough to staff a volunteer fire and rescue force. However, before taking action, commissioners wait for results of a referendum. In the meantime, the committee continues its work with Jack Goldstein and Bill Uebele as co-chairs. DID YOU HEAR mumbles again recently about the third bridge to the island? The Emerald Isle one is such a breath-taker, rising above the waters gracefully, giving us that wide view of boats in the waterway, … egrets moving stifflegged along the edges of the many scattered islands, that we kind of hope a third bridge, if it comes, will be like that. But, “mumbles” did not lead to action. We talked with Mr. Al Tirrell, the builder and franchiser of this creatively put together playground on Salter Path Rd. next to the Yuletide Shop; he pointed out the lava rock they brought from California—it’s gray and shimmery and very lightweight which makes it easy to work with. 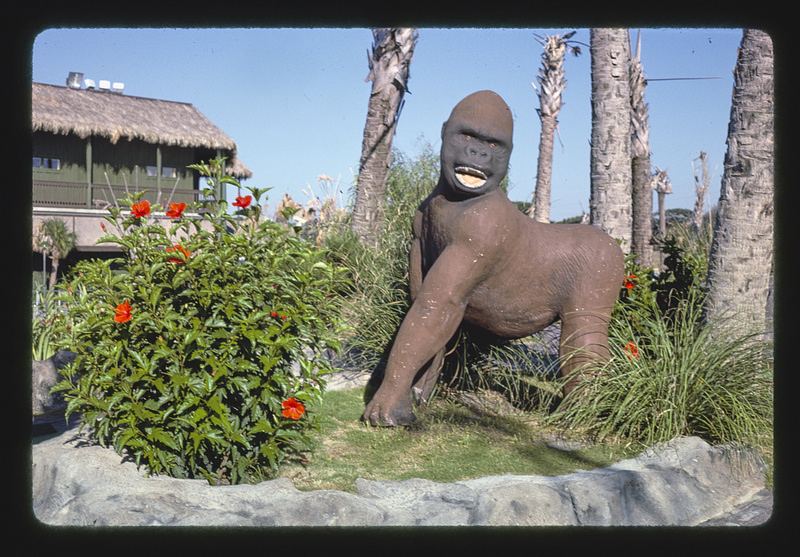 There is sod from Georgia; there are thatch roofs from Florida, and 21 varieties of wildlife. The original owners are L.P. La Bruce, described as “a nurseryman” and A.S. Miles, both from Myrtle Beach. 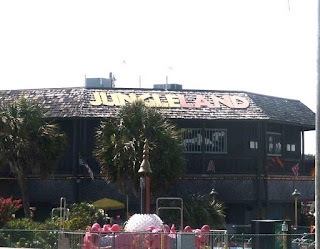 Jungle Land would remain in business for over 30 years. In describing the center’s functions, Director Ned Smith makes the first mention of “16 aquarium tanks,” which “will be seething with marine life typical of our very own coastal waters….” Also, we learn Charles Johnson will be the first “Aquarium Specialist,” and he talks about volunteers to help “in the washing of the gravel, …putting up some of the displays…. Then after that, the big thing will be keeping the tanks going—cleaned and replenished. Eventually tour guides will probably be trained….” It’s beginning to sound like Pine Knoll Shores’ Aquarium. In June, readers learn the street leading to the Marine Resources Center will be been named “Roosevelt Drive” in honor of “donors of the property.” In August, the Board of Commissioners begin holding regular meetings at the center on the first Tuesday of each month. Then, finally, in September, readers are told the “opening of the Marine Resources Center here in PKS” attracted a large crowd, “Somebody said that 300 chairs had been set up in the auditorium area and there were many standees in the periphery…. The Governor, in his remarks, said that the marine projects undertaken in these centers will have importance throughout the world….” Well, Pine Knoll Shores’ Aquarium may not be world famous, but the enthusiasm of Governor Holshouser and local residents seems justifiable given how successful it has been. Seldom in the 1976 Shore Line is there any sense of changes in the larger world, but sometimes references make a contemporary reader think of such changes. For example, in 1976, articles during hurricane season refer to Civil Defense, which started in this country at the beginning of the Cold War—1951, to be exact—and gradually changed its mission from disaster preparedness in case of atomic/nuclear attack to recovery efforts after natural disasters. In 1976, Pine Knoll Shores has local volunteers working as a Civil Defense Corps. In 1994, Civil Defense morphs into Community Emergency Response (CERT) under FEMA, which has been part of Homeland Security since 2003. However, the consistent focus of the Shore Lineis local, so it seems appropriate to end with a 1976 description of a talk given by Cap’n Jim Willis, a source then and now of local lore. He explains regional terms of address: “…a man over forty should be called Cap’n, and a man over seventy is called Uncle as a mark of respect. And most people are called by their first and middle name or by the first name with a descriptive prefix such as Little George and Big George to distinguish father from son….” To some extent, this tradition may persist among locals on Bogue Banks, but even in 1976, it sounds quaint to newcomers who are building Pine Knoll Shores. History in the making and resistance to change are unconscious themes of Shore Line editors Mary Doll and Betty Hammon in 1975. References to bridges, roads, ordinances, fire protection, garbage collection, mail delivery, and boundaries dominate the paper’s pages. In five years—from 1970 to 1975, Pine Knoll Shores’ population has grown from 60 to 680. Doll and Hammon note: “There were 350 at the time of incorporation.” In 1975, like today, the majority of the population is over 50 with a sizeable number over 60. However, unlike today, Pine Knoll Shores residents are clustered in a small geographical area, from the border of Atlantic Beach to Bridge Road (now Pine Knoll Boulevard). Points were brought up regarding costs of services as compared with anticipated income. Services which would have to be provided in an annexed area would include policing, street lighting, and road maintenance. An annexed area would come under PKS zoning ordinances. Development is now controlled by county ordinances and the area comes under planning regulations covering coastal resources. The following month, readers learn about “the bid by Indian Beach for annexation of the area directly west of Pine Knoll Shores” and the desire that county zoning remain in effect in that area. Immediately, Pine Knoll Shores’ Board of Commissioners go “on record opposing that annexation by Indian Beach” and make a counter claim to the General Assembly, knowing the bid by Indian Beach has “apparently been received favorably by the House.” The issue remains undecided in 1975. On another issue, town residents are less ready to accept change. 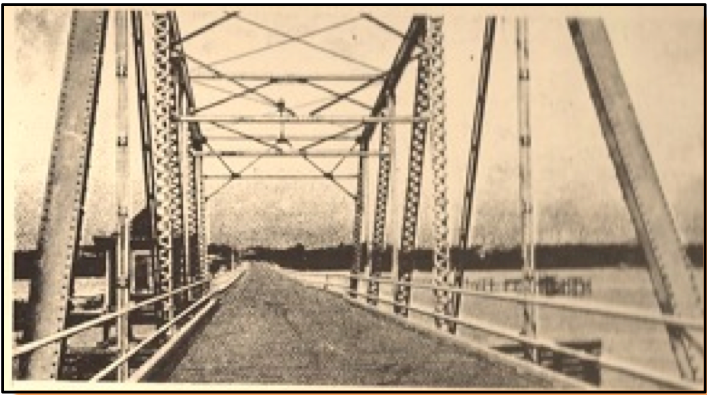 The January 1975 Shore Line reports a study group to consider “pros and cons" of a bridge from the mainland to Pine Knoll Shores.” The name “Bridge Road,” mentioned earlier, reflects A.C. Hall’s city plan, which proposed a bridge from the north end of what is now Pine Knoll Boulevard or McGinnis Point to Morehead City. In accord with the results of a survey, Pine Knoll Shores’ Planning Board supports plans for “a third bridge across the Sound,” but adopts the “majority view…that the bridge should not come into Pine Knoll Shores.” So, momentum for a third bridge between Bogue Banks and Morehead City stalls in 1975. …there is a push on by Atlantic Beach to bring PKS into their postal area, which would mean a most inconvenient change of address for us as well as a curtailing of services (Atlantic Beach wants what is known as city service and this does not allow for things like buying stamps from the carrier, etc.). 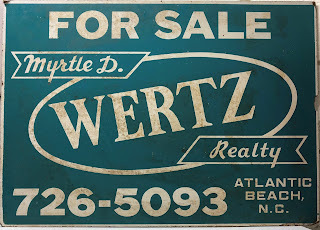 Even though a system of house numbers is ready for town approval by August 1975, resistance to becoming part of the Atlantic Beach postal district remains strong, and many continue to use a rural route number instead of their house numbers for mail delivery as long as they can. A more successful partnership is formed with Atlantic Beach for fire protection. Also, Pine Knoll Shores rather easily moves from having individual resident contracts for garbage collection to a universal collection system under a town contract with Atlantic Sanitation. A decision to ask the North Carolina Department of Transportation (DOT) to pave Salter Path Road comes with a condition that the road remain two-lane. However, despite lobbying efforts by Pine Knoll Shores’ mayor and commissioners, DOT makes no progress on this project in 1975, beyond a commitment to do the job. In terms of what is in their control, town commissioners proceed successfully. They pass ordinances on a range of issues such as zoning, parking, signs, noise, traffic, farm animals and pets. 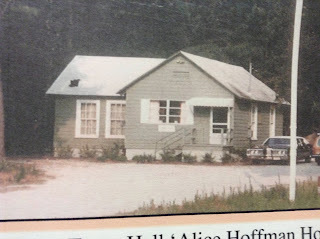 Other notable events include moving town hall from the Atlantis Lodge to “a small house set far back…on Bridge Road.” The new town hall described here as “a small house” was formerly Alice Hoffman’s kitchen, the same structure Don Brock was forced to abandon as his local office in 1974. It is large enough for the town’s small staff but too small for large meetings. So, commissioners continue to meet at the Atlantis Lodge until August 1975, when they begin to hold meetings at other locations around town. 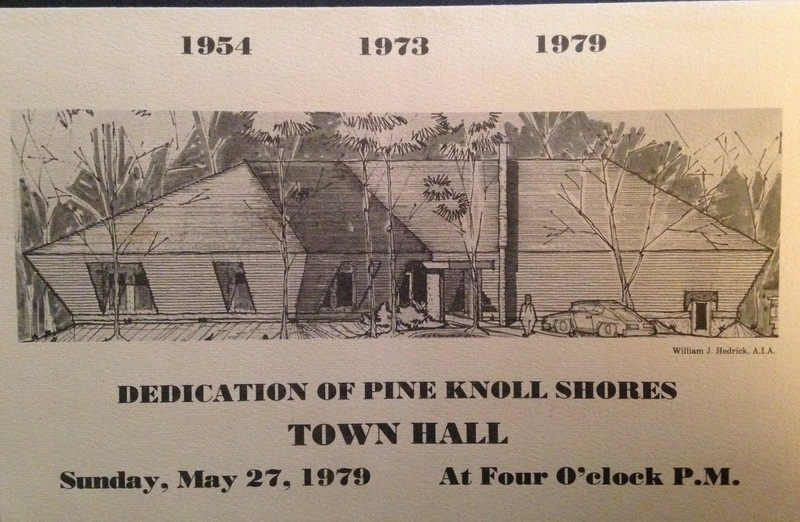 Also of historical interest is mention in July 1975 that George McNeill (for whom the Roosevelts named McNeill Inlet) is stepping down from Pine Knoll Association (PKA) homeowners’ board. According to Doll and Hammon, he “served for more than eight years, since the whole thing began here in PKS.” Interestingly, in a later 1975 issue of the paper, we learn of the Kirkmans arrival in Pine Knoll Shores. Ken Kirkman will join George McNeill’s law firm while it is still handling most of the local legal work for the Roosevelt family and the town. Kirkman provides legal services for the town many years after George McNeil’s death. 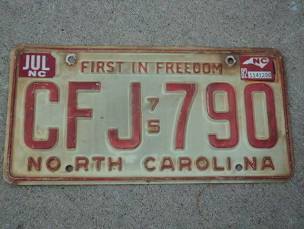 North Carolina history buffs and collectors of vintage license plates may be interested in knowing the first Pine Knoll Shores’ city tag (at the time a requirement for all municipalities in North Carolina) comes into use in 1975. Also in 1975, Hammon and Doll comment on the new motto on the state license plate: “First in Freedom,” chosen at the end of 1974. For those interested in local history, I recommend the 1975 Shore Line as a good source. 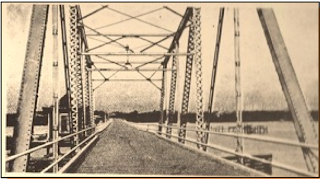 In various issues, Hammon and Doll discuss the swing bridge from Atlantic Beach to Morehead City; place names on Bogue Banks that have not been used for over a century—Belcove and Rice Path; the “road” to those places; World War II days on the island, when “there was a patrol riding the beach”; days when Morehead City was known as Shepard’s Point; and the possibility that Arendell and Bridges streets were named for Bridges Arendell, perhaps a spelling variation of Arundell of Arundell Castle in England. Clearly, early Shore Line writers and readers enjoyed learning about the history of this area as much as we do. There are 235 houses, 122 condominium units, 42 apartments, and, at least, one alligator “surfacing occasionally, sunning himself on the sand” in Brock Basin. Mary Doll and Betty Hammon are stillShore Line writers and editors, but Doll is sometimes writing from faraway locations, and other residents begin to submit articles from town and abroad. The 1974 Shore Line also contains a few editorials; they hint at local conflict. The year begins with commissioners’ passing a controversial zoning ordinance addressing both the height and density of structures in Pine Knoll Shores. “No building or other structure of any kind shall exceed either five stories or fifty feet in height….” The “density clause” limited “…all structures to no more than ten dwelling units per acre…” and specified additional limits for commercial buildings and off-street parking. In the same month, the first official club of the new town begins to form with Martha Odell Flynn as its first chairperson. After meeting with a leader of the Garden and Civic Department of the Women’s Club of Morehead City, Flynn and a small group of Pine Knoll Shores women decide to affiliate with the Garden Club of North Carolina, a member of the National Council of State Garden Clubs. In the following month, the group officially becomes the Garden Club of Pine Knoll Shores. In May,aShore Line has the first “Letter to the Editors,” anonymously attributed to “A Citizen.” It compliments individuals by name for “joining in efforts to work on the many jobs that need doing…” while making a plea for residents to be “less critical and little more willing to lend a hand….” One person named for her “outstanding contribution” is Ruth Bray, a member of the town’s first Board of Commissioners and manager of the Atlantis, which played a notable role in the town’s early history as the location of the first Pine Knoll Shores’ town hall. Readers also learn in the May issue that Don Brock, a representative of the Roosevelts in Pine Knoll Shores, has left “the building” he was using for an office in Pine Knoll Shores and has moved to a location in Morehead City. This will prove to be a temporary move for Brock. Photo from Pine Knoll Shores' town album by Phyllis Makuck. I was hoping for more information since other historical records document a controversy over the structure’s not being in accord with local covenants. 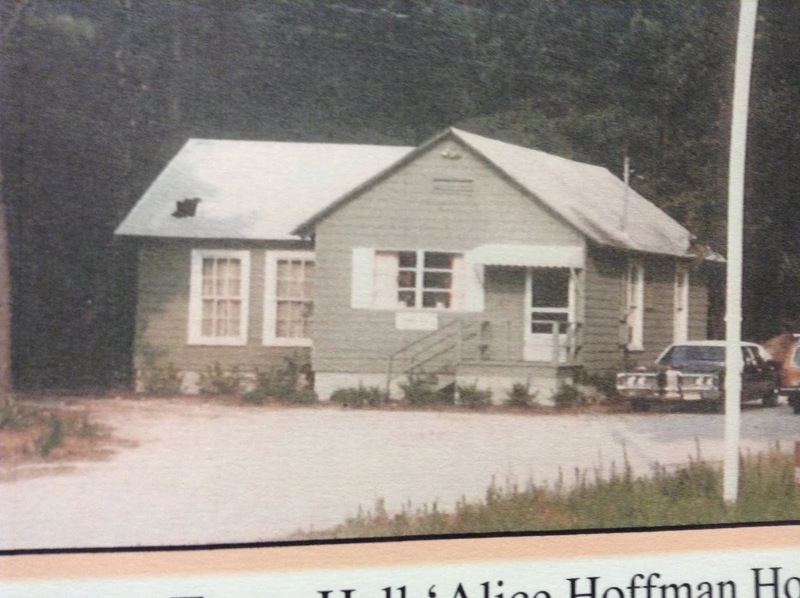 We know a portion of Alice Hoffman’s house served as Brock’s office and was later moved from Yaupon and Salter Path Road to become a temporary town hall. Although there is no confirmation of either detail in the May 1974 Shore Line, the structure in question is probably the same building referenced in this vague passage in the June 1974 issue: “The deed to the Town Hall site has been received from the Roosevelt interests and has been duly recorded, so that, in the near future, the building will be moved to its new spot on Bridge Rd.” (today’s Municipal Circle). 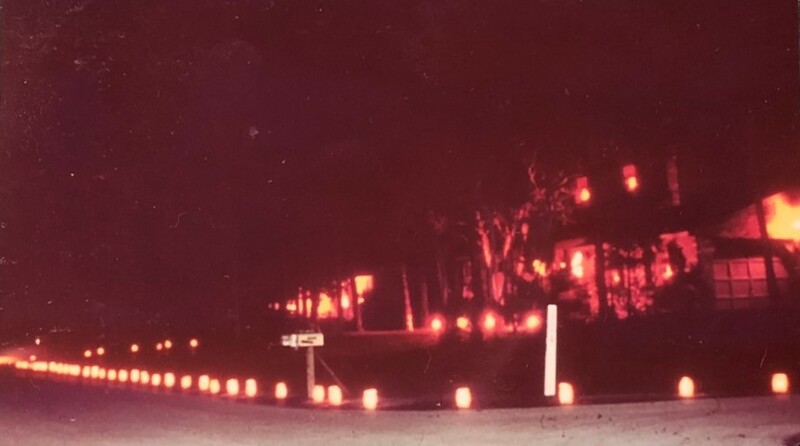 The July newsletter reports on the annual meetings of two homeowner associations: Pine Knoll Association (PKA), the town’s first HOA, and Pine Knoll Shores Corporation (PIKSCO), holding its second annual meeting in 1974. July also marks the beginnings of the Welcome Wagon in town, started by Sycamore Road resident Jeanne Miller. Just over a year ago, we became a Town, full of hope and an almost child-like idealism because we saw that we had a beautiful island paradise and a group of clear thinking residents. In this past year our Town has grown; its people have come to know each other better. Differences of opinion have arisen, facades have dropped, irritations have erupted, territories have been threatened. We are still essentially the same group but with our self-awareness sharpened. We ought to be able to stop ourselves, then, from becoming petty and picky as we hang together trying to make our Town hum happily…. We all have our one little life to live; it’s not very long either. Do we have time really to study the dark gloomy aspect of everything, dwelling on what seems to us to be the inadequacies of others? Anyway, sometimes those who are the target of complaints are not even aware of it; so then, isn’t it the growler himself who suffers the most, bogged down in his own mumblings? Cheer up, you guys! Go catch a fish or watch a sunset. Let’s keep ourselves channeled and be the rare community where dreams can be accomplished. What Shall We Call This Place?